The road to jazz drumming one tempo at a time. 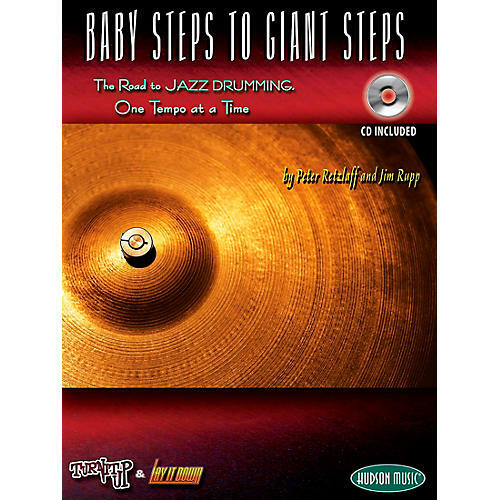 The third collaboration between Hudson Music and Drum Fun, Baby Steps to Giant Steps is a complete educational package that expands on the fun and developmental benefits of the popular "Turn It Up & Lay It Down" CDs by combining the play-along tracks with lesson material designed to help drummers improve their playing skills while increasing their awareness and appreciation of jazz drumming. The professionally-produced minus-drums play-along CD features eleven tracks based on jazz standards that gradually step up in tempo from 100 to 310 beats per minute (BPM). This innovative, incremental approach gives drummers the opportunity to work on developing their speed, groove and technique one step at a time-just as the title suggests. Written by two of today's most respected jazz drummer/educators, Peter Retzlaff (Diane Schuur, Maynard Ferguson, Drummers Collective faculty) and Jim Rupp (Woody Herman, Ray Charles, Tony Bennett, Natalie Cole), Baby Steps to Giant Steps includes lead sheets, drum charts and recommended patterns for each play-along as well as an extensive tutorial on jazz drumming-covering key topics such as developing the jazz ride pattern and feel, feathering the bass drum, independence, comping, trading fours and playing with brushes. All of the songs and instructional content in the book are clearly explained, notated and accompanied by a recommended listening list. The road to jazz drumming starts with baby steps. Get started and order today.